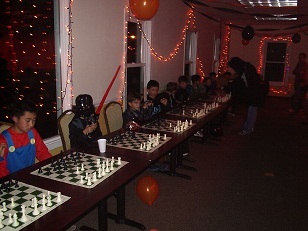 This year’s Halloween party at the Chess Club of Fairfield County was a resounding success as the impending weather disaster managed to hold off for a few more days (unlike last year’s freak snow storm). 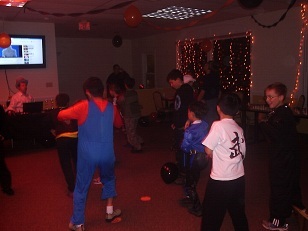 Twenty participants, ranging from Captain America to princesses to ninjas and power rangers, had a blast playing games and dancing to music, including their own rendition of Thriller! All of the children also took on a monster in a simultaneous exhibition. Unfortunately for them none survived as the monster won all of the games! 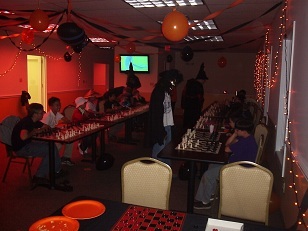 All in all everyone had a great time and it was a night that will not soon be forgotten.